Pulmonary Roundtable: What do you see? The patient is a 59-year-old female with history of hepatitis C, currently on dual therapy with pegylated interferon and ribavirin for last 2 months presented with complaint of cough. 1. Hepatitis C, liver cirrhosis. 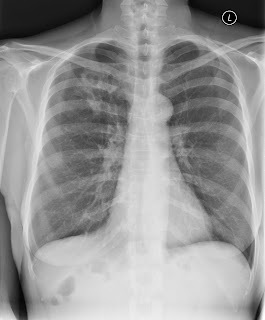 that time with negative chest x-ray. Yikes! I see a RUL cavity, and I think if I zoom in, I can spot the AFB swimming around in it. I hope you had a mask on while seeing this patient? What was the outcome? I saw te cxr first, so I had on a mask before I went into the room. I can't say the same for the hepatologist who sent her here for "cough and pulmonary nodule". Anyway, she was prescribed 4 drugs and 3 afb's were negative. Because MDR is somewhat of a concern here, we had to proceed with bronch (last case of day and lots of masks). in view of sustained afb negative results go in for a Mantoux test again and her immune status(hiv testing) and do consider a fungal etiology too so send in for appropriate examinations.Seeing cavities is a routine for us!the first differential is always ofcourse tuberculosis. did she symptomaticaly improve once she was put on ATT? There's some significant air trapping going on. Given the Asthma HX, what respiratory meds is the patient on? Are you seeing any dips in cardiac output?